The history of the Assynt Centre in Lochinver and Community Care Assynt are closely interlinked. The Assynt Centre was set up originally in 1984/5 by Kirk Care as a Daycare Centre, with residential respite care added later. Subsequently, the local authority took over operations, but in 2005 the residential beds were closed and in 2006 the 24/7 respite service was downgraded to weekdays and a limited number of weekends per year. A community group formed, the ‘Assynt Centre Action Group’, to lobby for the return of more respite opportunities. When in February 2010 the Highland Council decided to close the Assynt Centre, the community swiftly stepped up to the mark and put together a business plan to run local services themselves with a new company – Community Care Assynt CIC. The local authority, the Highland Council, agreed to financially support the newly formed Community Care Assynt (CCA). The newly formed organisation reopened the doors of the Assynt Centre on 1 September 2010. Starting initially as a Community Interest Company our first few years taught us it would be more sustainable to apply for Charitable Status instead. On 15th April 2014 the Office of the Scottish Charity Regulator awarded Charitable Status to Community Care Assynt Ltd. 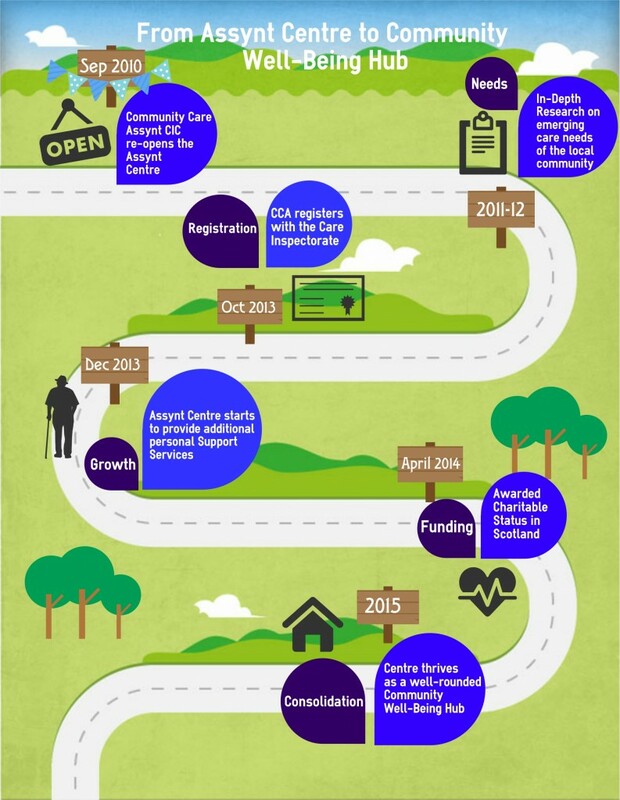 Through the years we have seen increasing support needs emerging from our existing service users at the Assynt Centre. A needs-assessment in 2012/13 found that while initially almost two thirds of regular service users lived independently and were able to visit the Centre most regularly, additional support would become necessary to allow people to continue to remain active in their community and peer-group. This led to CCA registering with the Care Inspectorate in 2013, which now enables us to provide personal support to up to 5 clients on any day, which enables us to make sure as many of our service-users can use services and stay involved in their peer group for as long as possible.